In our recent system upgrade, we have added a new feature - Filter. You can use it to send a segment of the selected list(s). So, how it works? 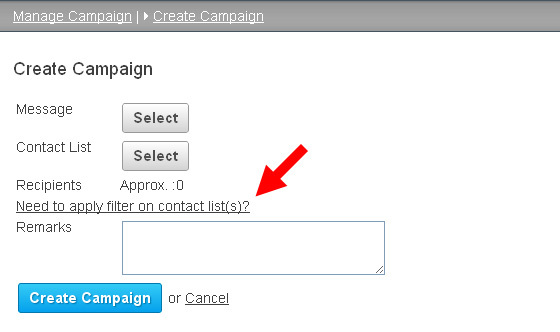 1) Go to "Contact", "Filter", then press the "Create Filter" button. 3) Choose the filter criteria you would like to select, for example, all male recipient in Korea. 4) It's worthwhile to talk about the relation (AND and OR) in between the two criteria. As the name stated, if you choose AND, it means that you select all male recipient, and they must be in Korea. For the OR, it means that you select all male recipient (in any country) or Korea (in any gender), recipients matched either criteria will be selected. Press Create Filter button. That's completed the filter creation. But how it is related to your campaign? When you create a new campaign, you can choose a filter now. 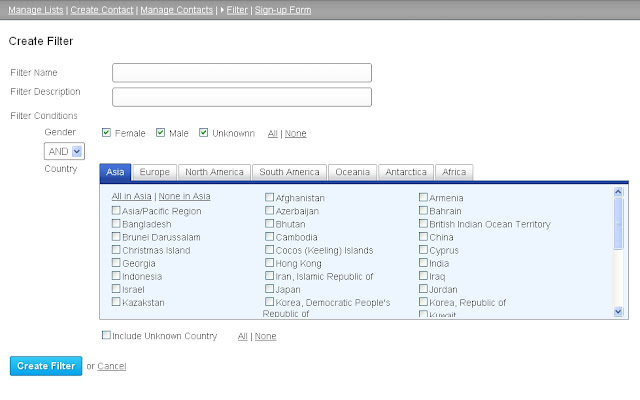 First, select the contact list(s), then choose the filter. It will show you how many recipient were selected for this campaign and your campaign will be more personalized and relevant to your email content now. At this moment, we provide two criteria to create the filter, and we are working hard to put more criteria to create a more powerful filter. I look forward to the segmentation feature for a long time! It works nicely. Your article is marvelous but I need some info about email marketing training. According to me, email marketing is said to be a good type of marketing technique.